Residents in Scituate, Mass., were fed up with brown water caused from sediment in the town’s old water pipes. In November 2013, they voted in favor of a $22 million water main replacement project, taking place over three years, to install 24 miles of new underground pipes. During year two (2015) of the three-year project, the town’s public works department hired utility contractor R&D Site Development to complete a $3 million portion of the project. 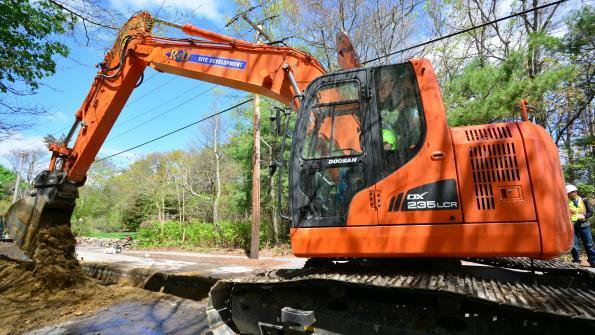 Owners Bill Daley and Steve Reppucci purchased a Doosan DX235LCR reduced-tail-swing excavator from Equipment East, the local Doosan heavy equipment dealer, because they would be trenching in limited-access areas. The excavator, equipped with a hydraulic quick coupler and various trenching buckets, helped to install 30,000 feet of water mains, hydrants and services. Work began in May 2015 and took approximately 18 weeks to complete. The reduced-tail-swing excavator was an ideal size for the underground project, according to Daley. With Reppucci seated inside the excavator cab at the controls, he removed soil from the trench and left the spoil pile next to it. One area where the contractor worked in 2015 was along First Parish Road and Maple Street, where mature trees line both sides of the road. Daley says his crew successfully installed 12-inch pipe in the trench. Reppucci used the excavator to lift and place the pipe in the trench where an employee helped connect the pipe sections. A Bobcat skid-steer loader paired with a bucket backfilled the trench with dirt from the spoil pile. Click here to learn more about Doosan Infracore Construction Equipment.